These Hit-Girl books have been entertaining and fun, and have allowed for some great creators to leave their mark and tell their stories. This new 'season' seems to aim to do the same, and starting with a team like Kevin Smith, Pernille Ørum and Sunny Gho is a great way to set a new standard. 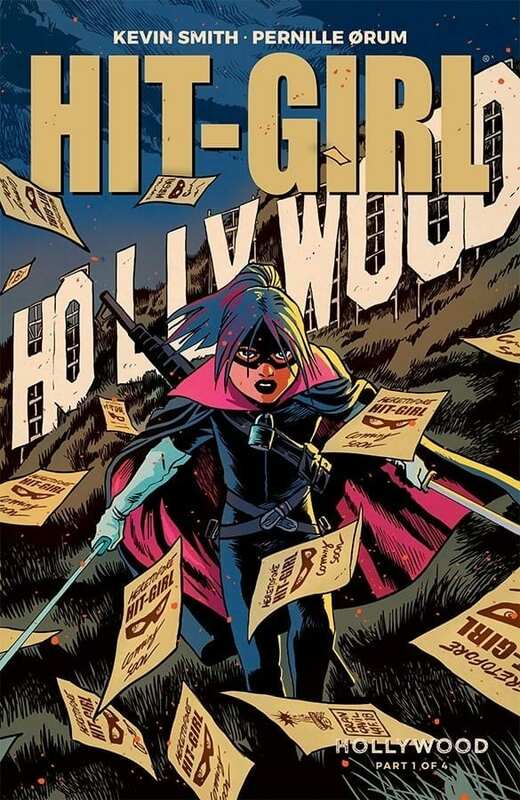 Hit-Girl Season 2, Issue #1 finds new incoming writer Kevin Smith (you know him!) and animation veteran Pernille Ørum (DC Superhero Girls, Blush, Coral) continuing the pint-sized assassin’s world tour of bad-guy killing by taking her and her arsenal straight to Hollywood! As it has been since this new Hit-Girl series began, a new arc finds both a new writer and a new artist taking the reigns. Sitting behind the keyboard is pop-culture podcaster and filmmaker Kevin Smith. It’s no surprise to his fans that Smith is writing a comic book. He is a huge fan of the medium and has written comics before (most notably runs on both Daredevil and Green Arrow that did much to bring both characters back into prominence). What will be a shock to fans is the amount of dialogue in this issue; there is literally only one line of ‘spoken’ word (one word balloon) in the entire thing and that comes on the last page. 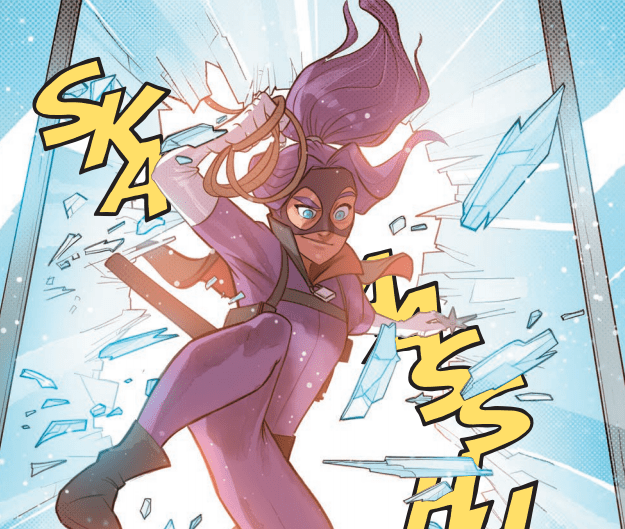 The bulk of the issue is one well-choreographed long action scene that sees Hit-Girl take on two school shooters in her usual gruesome and effective manner. 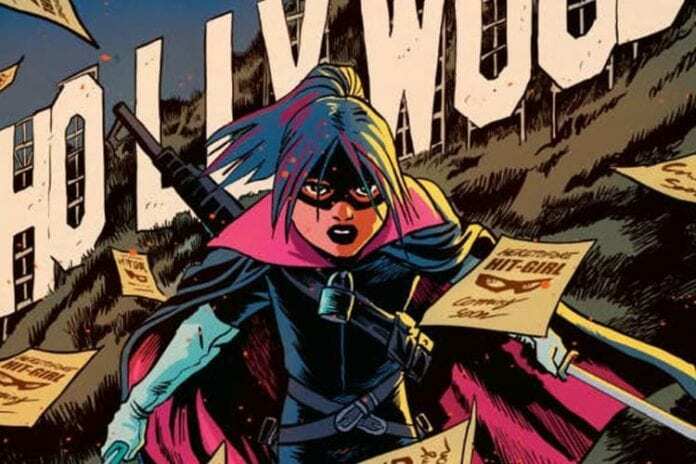 While taking down her latest enemies, Hit-Girl comes to find out someone in Hollywood is making a movie about her violent exploits. And so the high-concept takes off. It’s a great idea for the character and creates some strong possibilities. Making this issue mostly ‘silent’ is a wise choice. It gives it an excellent, swift pace and it also proves Smith, whose detractors tend to critique his use of dialogue as a crutch to lean on, does indeed have a keen understanding of what makes story-telling work in sequential art. Even if this your first time reading Hit-Girl, Smith shows you enough to be able to understand what is going on. It’s efficient writing but not boring at all. Pernille Ørum’s comes from the world of animation, and it shows in the fluid nature of the linework, layouts and slight manga/anime influence on faces and expressions. This cartoony vibe allows the violence to be less disturbing, which over-all helps the concept of a teenage killing machine. The thick lines also look bold and crisp. When you add in the pastel palette of Sunny Gho, the entire artistic package has the feel of being animated. Every artist on this series has made Hit-Girl their own, and Ørum and Gho are no different. These Hit-Girl books have been entertaining and fun, and have allowed for some great creators to leave their mark and tell their stories. This new ‘season’ seems to aim to do the same, and starting with a team like Kevin Smith, Pernille Ørum and Sunny Gho is a great way to set a new standard.